How to order an apostille for a marriage certificate? 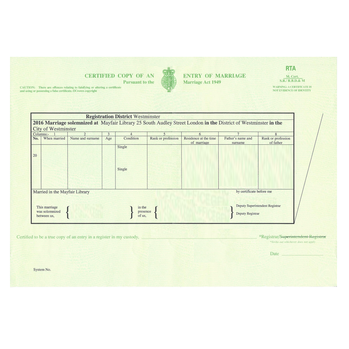 Order the standard service online from our order page, print the order confirmation and post this to us with the original marriage certificate. If you have misplaced the original or would prefer not to send this to us we can assist you in obtaining a replacement marriage certificate. Order a replacement marriage certificate by email? When presenting a marriage certificate overseas you may also be asked for a translation of this document. We can translate standard UK marriage certificates for ONLY £48. Please contact us for guidance.